I have decided to take part in a new flickr group set up by Abi Bansal which consists of taking a group of 5 photos during the week of everyday things. I really like this idea as I like natural photos and like the idea of a non stressful way of improving my photography. I think that too often we miss some of the most beautiful things as they are items that we might see or use all the time. I am hoping that this group will give me motivation to find inspiration in other areas and futher my design work as well as my photographs. 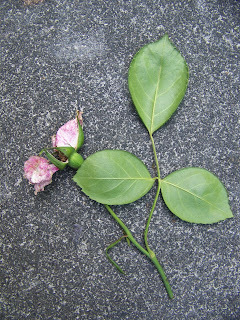 So the photo above is my first entry, a deadheaded rose from my balcony. I decided to look at nature, a common inspiration to my work, but in a different way. I love this time of year when all the flowers are appearing, but they do not last for long. This week I will be photographing the beauty and sadness of dead or dying nature. We will see where it goes as it is totally unplaned and none of the photos will be styled in anyway. I hope you like it. Take a look at the rest of the photos from other artists, there are some lovely ones.